After parking your car at the town square, continue on foot, through the gateway giving access to the old town, and Casa Sorano will be at 200 meters from there. The path go across ancient houses and the completely pedestrianized historic town center. From a tiny door, you get access to the house, via a small staircase leading to the living room. To the left, you will find the kitchen and, to the right, the bathroom with the bedroom. Every room has big windows. From Casa Sorano, you can climb up to the narrow Piazza Del Poggio and, from there, reach to the terrace of Masso Leopoldino, where you will enjoy a 360° panoramic view of the town and its surroundings. From the characteristic Piazza, it is possible to descend to the renaissance Porta dei Merli and arrive to the Lente river and its tributaries for a beautiful walk along the Etruscan Vie Cave. The San Rocco necropolis, for example, can be reached in 20 minutes. 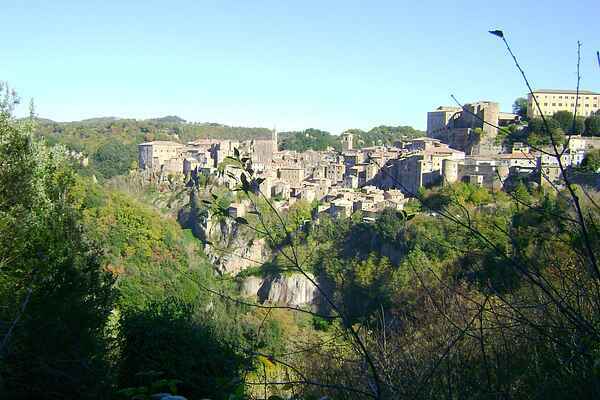 Guided visits of the Orsini Fortress, at 15 minutes from the town square, are available. Inside the Fortress sits a small historical and archaeological museum. Besides this, from the town square it is possible to plan excursions or rent mountain bikes, go horseback riding, Nordic walking, or take part in other activities in addition to the countless trails available for avid walkers.